KangooClubAZ – Arizona Kangoo Club!! 1 Hour – Burn up to 875 calories! First class is $25.00, packages are available! 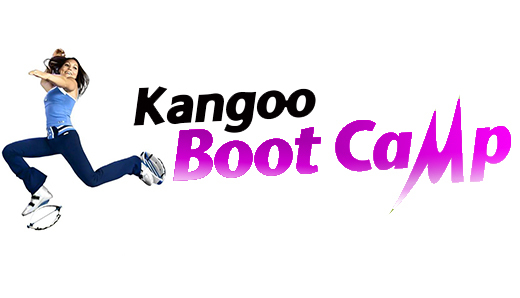 Get Jumpin' with Kango Club AZ and Kangoo Jumps!! 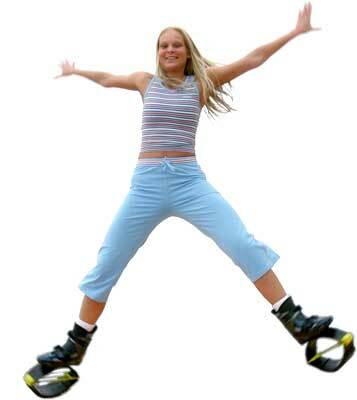 7) and of course….Kangoo Jumps are great for going out Dancing!!! 2. Safety: Kangoo Jumps are world’s lowest impact shoes available. They protect (and actually reinforce!) your ankles, shins, knees, hips, lower back and spine. 4. Most Enjoyable: usually exercise is boring and painful. Not with Kangoo Jumps: you’ll enjoy every minute you are on them! 6. Space Requirement: Kangoo Jumps are referred to as “a gym in a bag”. They satisfy all requirements for a full body workout. This means you don’t need to clutter your personal space with large and expensive equipment. As little as 2-3 square meters (20-30 sq. foot) is all that is needed for your Kangoo Jumps workout. 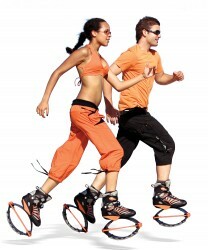 Kangoo Jumps were originally developed for joggers, to reduce the impact stress on joints. Whether you are an avid jogger, a serious runner or a casual health-conscious exerciser, you will quickly appreciate the incredible number of benefits that Kangoo Jumps provide. Reducing impact shocks to your ankles, knees, shins, hips, lower back, and spine, by up to 80% is only one of them. A Swiss chiropodist study shows that Kangoo Jumps correct pronation and supination conditions originating from the lower leg, while they are being used. Stress reduction and correcting pronation and supination are two of the many reasons doctors recommend Kangoo Jumps, for rehabilitation after surgery & for prevention of injuries. These benefits help explain why, so many people who at one point could no longer jog or exercise can jog / exercise again in comfort, with confidence and without pain. Kangoo Jumps usage also dramatically increases endurance, which is demonstrated by a scientific study conducted by Dr. J.E. Taunton at the University of British Columbia – Canada. “Scientific investigations with regards to impact forces have reported that: between 27% and 70% of runners or joggers are injured in the first year after commencement of running” Most of these injuries are impact-related. This is why impact protection is so important. Forget Crazy Diets! While we stress the importance of eating a balanced diet, we are actually more concerned with adding a pleasurable, non strenuous exercise element to your life, with Kangoo Jumps. University studies show clearly that you spend much more energy, or calories, using Kangoo Jumps, compared to usual sport shoes. However, this alone does not explain the dramatic weight loss stated by people who have been using Kangoo Jumps regularly. The secret lies in the lymphatic system. The lymph is the liquid which circulates in-between our cells, to carry the wastes and toxins, out of our body, keeping it healthy. Most of us are unaware that our bodies contain four times as much lymph fluid as blood. However our lymphatic system, which is also our immune system, does not have a pump, like the heart, to keep its liquid in motion. It depends on our natural movements for circulation! If we don’t move enough, excess levels of toxin actually clutters our lymphatic system and “poisons” our cells. In some places the lymph fluid actually crystallizes into cellulite, which many of us know is hard to eliminate. Rebound exercise has been found to be the most effective way to “re-prime the pump” and keep it going, due to the up & down swinging in a low impact environment, like with Kangoo Jumps. The lymphatic system also monitors our metabolism. As we get older, we seem to put on more weight, which becomes harder and harder to lose. Studies have shown that our base metabolic rate, which is the rate that our bodies burn calories, decreases as our lymphatic system becomes less efficient. As we regularly use Kangoo Jumps, our base metabolic rate will become increasingly more efficient, resulting in noticeable improvements in our muscle tone, and weight management. In fact, we are actually re-training each cell to perform as it did when we were younger. Once we have re-set our metabolism, we will burn more calories at a higher rate, and will not regain weight, if we continue using Kangoo Jumps. Your daily gentle workout will be most enjoyable listening to music. You can learn Kangoo Jumps basic steps and much more from our video “Home Fitness & Weight Loss”. Rebounder, Reboundology and Reboundologist are terminologies established by Albert Carter, Head of the American Institute of Reboundology. Here is the definition as given by Al Carter: “The common denominator of all exercises is opposition to the gravitational pull of the earth. Even before birth, the human body grows strong enough to be able to resist the ever present downward pull of Mother Earth. A child learns to crawl, walk, run, play and even throw balls by constantly competing with gravity. Formal exercise methods are no different. To exercise the body, one will carry out various movements designed around gravity, utilizing everything from ones own body parts to fulcrums, levers, pulleys, inclined planes and even dead weights to challenge major muscle groups. With Rebound Exercise, you also oppose gravity, but you also utilize two other natural dynamic forces found within our environment. Two forces which, for the most part, have been overlooked by other exercise methods. These forces are acceleration and deceleration. When your body stops its downward movement at the bottom of the bounce, the force of deceleration and gravity come into play. When the body begins its upward motion, acceleration is added to the other two forces. The physical human body doesn’t recognize these three different forces but simply accept the combination of the three forces as an increase of the gravitational pull of the earth. Logically, we know that increasing gravity is impossible, but the cells of the body don’t. Because all of the cells of the body have the capability to adjust to their environment, all of the cells of your body begin to adjust by becoming individually and collectively stronger. Is based on the combined forces of gravity, acceleration and deceleration. The gravity is the force which attracts us to the ground. The unit of measure of this force is called G. 1 G corresponds to our weight here on Earth, when we stand still. When we accelerate the G force increases. When we decelerate the G decreases. N.A.S.A has confirmed the ability of the human body to adjust to the change of gravity. When astronauts were sent to space for fourteen days, they lost 15% of their bone and muscle mass. Space rats lost 40% of their mass in only 7 days! Their problem has been how to re-condition the astronauts the most efficient way? Well, Albert Einstein had already stated in 1911 that our body cells could not make the difference between gravity, acceleration and deceleration. By combining the G force with the acceleration and deceleration while jumping repeatedly, we are subjecting our body to an oscillation between G (at the top of the jump) and 2-4 G (at the impact). Each of our body cell is put under stress and is being told to adapt to a higher gravity. Thus cells are getting stronger with rebound exercise. N.A.S.A’s scientist borrowed lymphocytes from astronauts and subjected them to a 3 G force in a laboratory centrifuge during 3 days. In that short time the cell membranes became 50% stronger than normal. This is probably the most significant discovery made by Al Carter. Here’s the concept, in his own words: “Each of us begins life in a single cell. After fertilization, the cell divides and transforms itself into two identical cells. Each cell carries the identical DNA programming with which it was endowed at the instant of conception. This incredible process of multiplication by division continues until at last the adult human is made up of a mass of 75 trillion highly intelligent cells. Each individual cell knows its business and performs its function in concert with all other cells. The Healthy Cell Concept precisely identify the basic needs of the cell to be healthy. The Healthy Cell concept includes, Cell Food, Cell Environment, Cell Exercise, and Cell Communication. For the incredible number of benefits inherent in Rebound Exercise I recommend securing your own copy of The New Miracles of Rebound Exercise. Suffice is to say that Rebound Exercise is a very important part of the Healthy Cell Concept. Only Rebounding fits the parameters of the perfect Cell Exercise. Reducing the impacts by upto 80%, they provide efficient protection to your ankles, knees, shins, hips, lower back and spine.Prescribed plyometric exercise drills with KJ’s provide a very safe, efficient environment for Youth Athletes. KJ’s provide half the impact to joints while providing More work, yet faster recovery, and fewer setbacks due to overuse injury. They train simultaneously all your body muscles (ref. NASA study on rebound exercise). They increase your endurance drastically, as well as balance and agility (stimulate proprioreceptors intensely). They make training enjoyable, thus increase your motivation. Creating a series of exercises using innovative Kangoo Jumps can save considerable amounts of workout time as well. Oxygen consumption is significantly increased while the cardiovascular and glandular systems are optimized. Training and cross training can continue, indoors and outdoors, throughout the year. KJ’s provide a safe level of instability and mobility for a dynamic core workout. Sport Medicine Doctors recommend Kangoo Jumps for rehabilitation after injuries or surgery. The benefit most sport doctors name is that Kangoo Jumps are a powerful strength & conditioning product that allows patients to continue a healthy rehabilitation / exercise regimen without the risk of over training. And Kangoo Jumps help prevent further injuries. Physiotherapists recommend Kangoo Jumps for rehabilitation after sport related injuries, to assist in the rehabilitation / healing process involved with stiff ankles, lower back and spine pain, as well as for many more specific conditions. Chiropractors recommend Kangoo Jumps for spinal exercise, which has always been the cornerstone of chiropractic-based rehabilitation programs. Kangoo Jumps seem to be ideal for spinal strengthening, optimum postural positioning, mechanoreceptor / proprioception / balance, coordination, flexibility, and intervertebral disc health through spinal pumping, or imbibitions, with the minimal possible impact. General Practitioners recommend Kangoo Jumps to correct and/or prevent health problems like obesity, cardiovascular condition, depression, constipation, back pain, bladder weakness, lack of energy, immune system deficiency, postnatal exercise etc. Ophthalmologists believe that rebound exercise enhances vision, as discussed in the book “Jumping for Health” by Dr. Morton Walker. Pediatricians recommend Kangoo Jumps (only for children from age 6 and above) to enhance coordination, increase spatial awareness, improve self-image, create positive energy and motivation levels, facilitate the learning process and concentration, fight obesity. Kangoo Jumps are also being used successfully with autistic and Down’s Syndrome children. Orthopedists recommend Kangoo Jumps to reduce pain and to prevent joint problems. Warning: Always seek the advice of your medical doctor before using Kangoo Jumps for any application. Limit the risk of aggravating or damaging joints. Physiotherapists and medical doctors recommend the use of Kangoo Jumps for patients as an important rehabilitation factor, as well as, the strength and conditioning aspects of Kangoo Jumps. The reduction of up to 80% of impact shock to your ankles, shins, knees, hips, lower back, and spine also allows athletes to resume their workouts and training much sooner. Too often, rehabilitation time compromises muscle control, proprioception, and balance. There are many different classifications of injuries and the related causal factors of each injury. Using Kangoo Jumps helps you limit the risk of aggravating or damaging joints that have been weakened by overuse or reconstructive surgery. Reducing Impact allows these areas to strengthen while your general health improves. For injuries caused by sedentary conditions, Kangoo Jumps are also an excellent rehabilitation factor, as it improves the patient’s cardiovascular system, musculature and skeletal systems. At the same time it helps motivate both the athletes, or athletically inclined individuals, as well as, the individuals who lead a more sedentary life style. Kangoo Jumps act as a shock absorber that generates a trampoline-like feeling of weightlessness, without the safety concerns of trampolining. Scientific studies show that, Kangoo Jumps rebound shoes are a perfect answer to children’s obesity and apathy. Kangoo Jumps provide all 33 benefits of Rebound Exercise, which N.A.S.A. quoted “is the most efficient and effective exercise ever devised by man”. With Kangoo Jumps they can run, jump and play all their favorite games. But structured, professionally tailored programs are also available for teachers. Kangoo Jumps alleviate the two major problems of physical training: Safety and Boredom. – Easy learning, within 2-5 minutes! Kangoo Exercise classes are a fun and energetic way to promote exercise as an important part of school life. For those who do not participate in organised school sport, Kangoo classes integrate pupils and promote positive unisex activity through group enjoyment. Kangoo Jumps are internationally committed to promoting fitness in schools through enjoyment.